I have a quick post today featuring Pink Paislee's Nantucket line again. I did an "inspired by" layout of our time in Captiva. 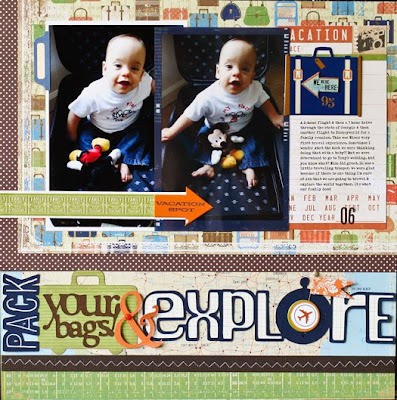 To read more about the details of how I came up with the layout idea, see my blog post at Pink Paislee. Sometimes it's the simplest moments from a vacation that I remember the most. On this particular day, we took a ride from Sanibel to Captiva Island. There was a funny story about a conversation we had that I wanted to remember. 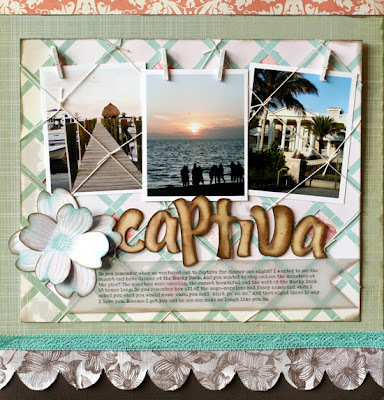 The pictures support the story and the products I used on the layout convey the "feel" of Captiva. Do you remember when we ventured out to Captiva for dinner one night? I wanted to see the sunset and have dinner at the Mucky Duck. And you wanted to stop and see the manatees at the pier. The manatees were amazing, the sunset beautiful and the wait at the Mucky Duck 1-1/2 hours long. Do you remember how all of the mega-mansions on the way had fancy names and when I asked you what you would name ours, you said "Ain't Po' No Mo'." And that right there is why I love you. Because I get you and no one can make me laugh like like you do. 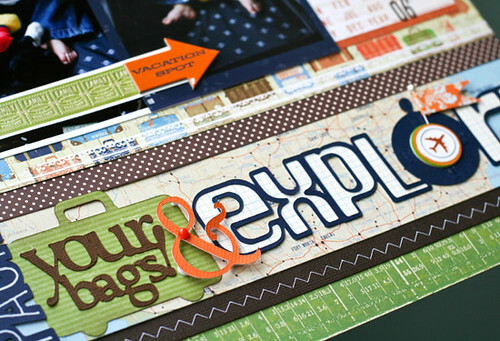 Up next, a school page and Design School Classes over at twopeasinabucket.com! Cricut: CM Traveler Cartridge - Pack Your Bags! I've been making plans for our yearly Halloween Disney trip this week when I stumbled on this Cricut layout I made a few months ago. This was from Nico's first trip on a plane + his first Mickey mouse shirt. It's so hard to remember my big boy being that tiny and bald. The story is about how well he did travelling. We put him through a 2-hr flight and 3-hr drive to attend a wedding. Then back on a plane a few days later to a family reunion in Disney World. My only excuse is that we were new parents and I'm not sure what the heck we were thinking. I used the Creative Memories Traveler cartridge to create the long title. I added penstitching with a white Uniball Signo pen to the word "pack", a few chipboard pieces, brads and a flag to add dimension to an otherwise flat title. I love the bold, graphic shapes in this Cricut cartridge, it's definitely one of my current favorites. The paper, chipboard and stickers are all from a very old Little Yellow Bicycle line. I think it was called Traveler and it was released two years ago. I love using up my "old" stash. Thanks so much for stopping by. I'll be back soon with a 2Peas layout and a sneak peek! My poor neglected blog. It's a victim of the summer and very hot weather we've been having in the Northeast. We escape every day to the beach, the waterpark or anywhere we can cool off. Nico has just started summer camp this week for the first time so I've finally had some down time. I sat down this week and made a page with Pink Paislee's new Nantucket line. It's one of the very few tropical lines that came out in 2011 and I was so happy to dig right in. 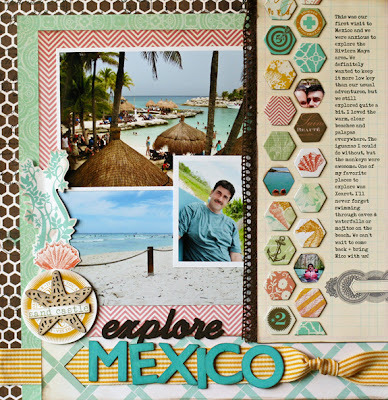 I started with a page about our trip to Mexico two years ago. 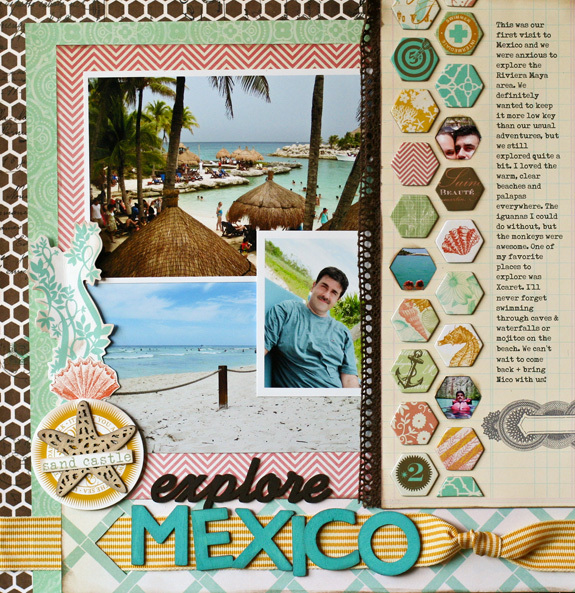 It's just a general overview page of the things that we loved, the beach and some of our favorite things. The entire page was built around the honeycomb shape chipboard embellishment. One of my favorite Pink Paislee products ever. To keep the shapes perfectly aligned, I popped all of the pieces out and used the negative as a stencil. I lightly traced the hexagon shapes right on to the patterned paper and then simply stuck on all of my shapes. To see a picture depicting exactly how I did it, you can visit the Pink Paislee blog and see my post dated 8/11/11. I deleted the photo before I got a chance to post it here. Sorry! I also cut a few of those honeycomb shapes out and placed tiny, 1-inch photos behind the paper. I like the window effect and "peeking" through photos. The title was created with Pink Paislee's Wood Shop letters and painted a bright aqua blue. I added a few layers of die cuts and wood starfish from the Nantucket line to complete the page. Thanks so much for taking a look. I'll be blogging on a much more regular basis now that summertime is winding down. I am so looking forward to spending more time creating. I miss it!